What parts are suitable replacements for an Ender 3 Pro? I'm new to 3D printing and I recently got my first 3D printer, an Ender 3 Pro by Creality. I've tried to find information about the type of nozzles should I look for. I'm trying to find stainless steel nozzles but there are so many models (M7, M8, etc.) and I have no idea what nozzle type I should get. I've tried searching on Google but the only info I could find is that the extruder is an MK-10. I am also looking for a heating cartridge for the hot end, but I still cannot find no information about the size that I need (15 mm/20 mm/30 mm). Also looked for info about the heated bed so I know what kind of thermistor I need (I found two types and no clue which one to get). Where can I find some technical information about these? 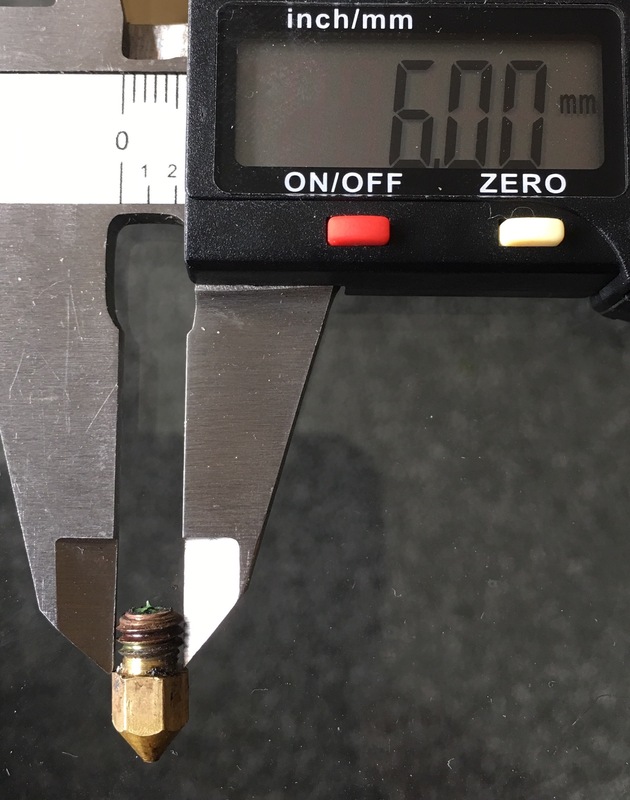 The Ender 3 takes an M6 thread (metric 6 mm diameter). Measurement of stock nozzle shown. Most sellers will list compatible printers Ender 2, Ender 3, Ender 4, CR-10, CR-10S, CR-10 Mini, CR-10-S4, CR-10-S5, CR-8, CR-7. Will Also Fit Any Other MK10 Heater Blocks. I recently bought some titanium alloy nozzles as the brass one got closed over after crashing into the glass bed. There is no such thing as a single MK10 hotend design. The Chinese aftermarket has mingled the designations. If it has a MK10 like Makerbot hotend, then the nozzles you are looking for are M7 threads. It appears (see this answer) that your hotend is a cloned MK10 and has different dimensions, you have the M6 version. MK10 was a complete change of the hotend. MK10 uses smooth OD thermal barriers with a larger 4mm OD 2mm ID PTFE liner. MK10 also uses M7 threads, vs the M6 of all previous models. This is because a 4mm PTFE liner is barely enough metal to make the outer tube with m6 threads. MK10 is completely incompatible with all previous hotend parts. Every part is different. Mk10 still uses MK9 feeder parts. 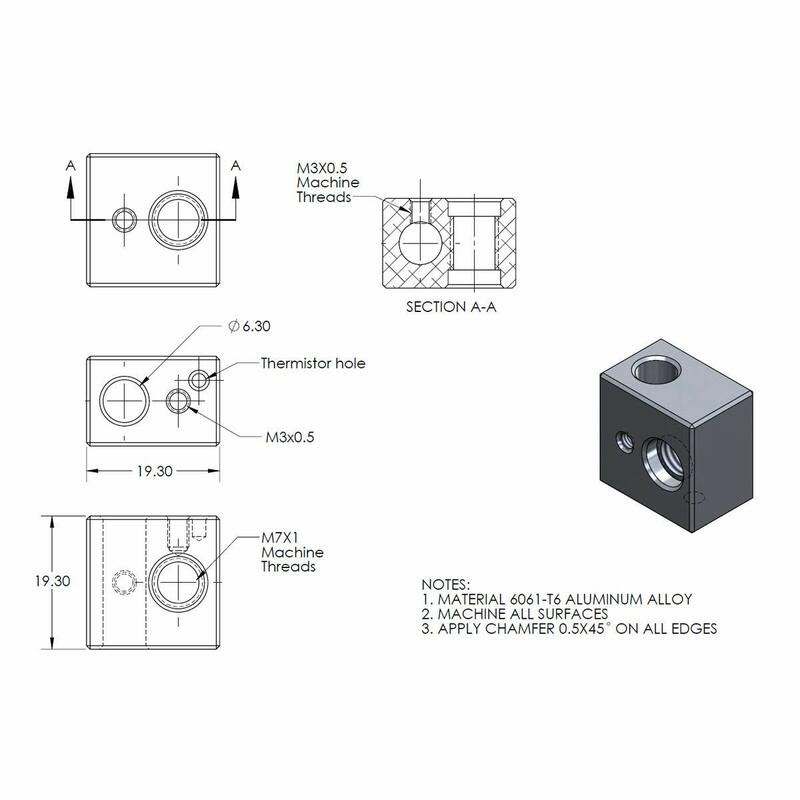 You could measure your current heat block (the width of the Aluminium block); if you look at the MK10 drawings of a proper M7 MK10 Makerbot (or derivative) hotend (below) you see that the width of the block is about 19 mm (which would be the length of the heater cartridge). As can be seen, your nozzle clearly is not an MK10. Not the answer you're looking for? Browse other questions tagged extruder hotend ender-3 replacement-parts part-identification or ask your own question. Can the filament tube be outside of the nozzle? Will this printer be good enough to make prototyping models? Does the Ender 3 need an 8 pin mini USB or 5 pin, or no difference?